You know, the terrible, awful moment in which you realize you have absolutely no junk food in your house at all, apart from delicious leftover Christmas candy and two bags of marshmallows (What? I like to eat marshmallows!) that you cannot eat because you gave it up for Lent, which is becoming definitively interminable this year, despite it apparently being the same six weeks in duration as every other year, so you announce loudly to the cats and the surrounding air that, FINE, YOU WILL GO FOR A RUN INSTEAD OF EATING DELICIOUS GARBAGE OF WHICH YOU HAVE NONE ANYWAYS. And then you go pull on your running tights, but don’t change your top yet because you get all distracted by writing this in your blog, which was, incidentally, meant to be merely a quick status update on Facebook, but, the laptop is in the same room as your running gear… After which time, you realize your life is passing you by the longer you procrastinate and soon it will be tomorrow before you run and that will mess up your entire week’s fitness plan. Before you leave to actually change into a running shirt and shoes, you reread that first paragraph and applaud yourself for writing the longest run-on sentence in your life. At least something was running. Amiright? I am. To think this was going to be an amusing, one-line Facebook status update. Just for the record, I did go for a run. 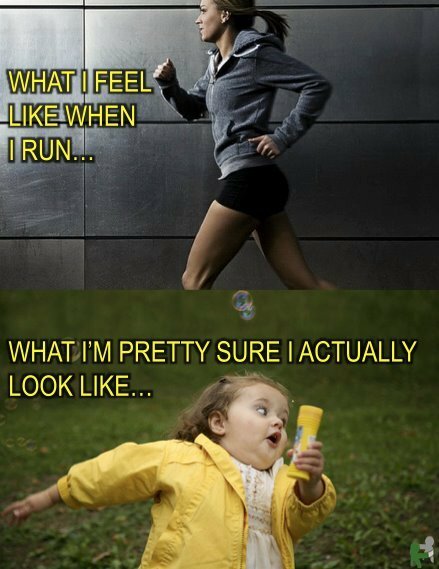 This is me running. Away from a photographer.